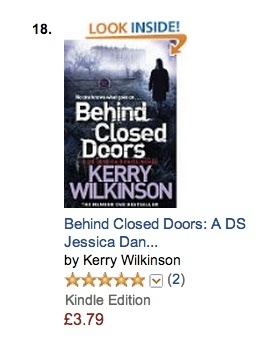 This morning, Behind Closed Doors became my eighth consecutive book to make the top-20 of the Kindle crime charts, following Jessica 1-6 and Watched. First, then, a thank you to the readers who continue to buy and read my books. It’s incredibly flattering and has genuinely changed my life. 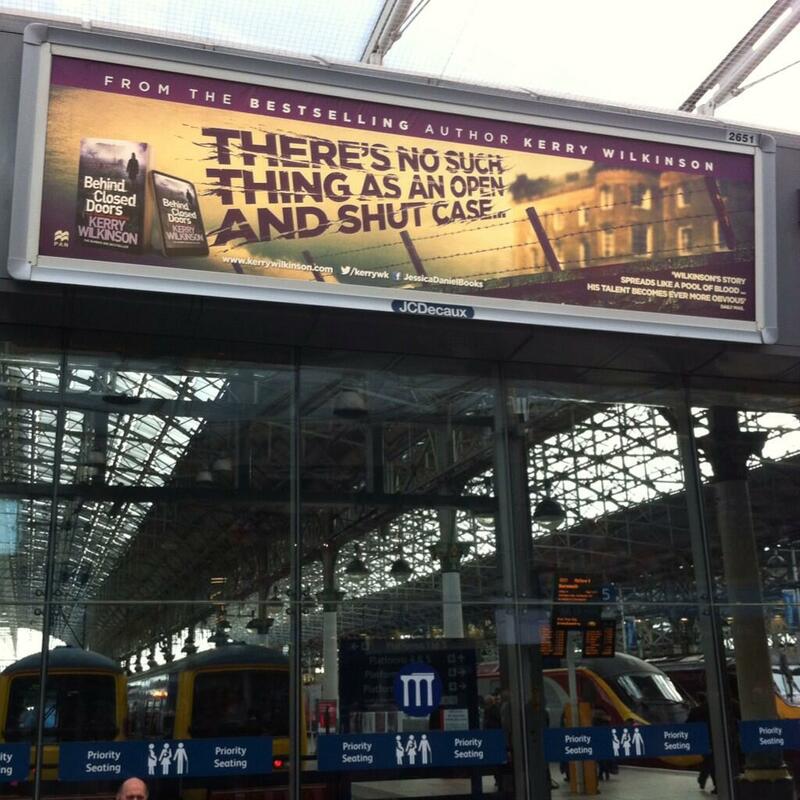 On top of that, the incredible billboard picture below is currently up at Piccadilly Station in Manchester. It’s HUGE and almost surreal. Thanks to Michelle Saunders on Twitter for the photo and, of course, my publishers for their support. Many authors like myself who’ve had initial self-published success have been completely abandoned by the publishers *not mentioning names* but that could not be further from the truth with Pan. If you’ve read Behind Closed Doors, you’ll know that it’s a little different from the other Jessica books. There are plenty of reasons for this. Firstly, I don’t want to keep doing the same thing. It’d be so easy to essentially write the same book over and over, change a few character names, and hope nobody notices. I try not to be lazy. That doesn’t mean everything I attempt will come off – I know that – but I’d rather try and fail, than write the same thing over and over. It’s not only boring, it takes the piss out of readers, believing they’ll buy any old shite because it has my name on it. That might mean a reader doesn’t like something like Watched – or Behind Closed Doors – but at least I’m not insulting people’s intelligence. Behind Closed Doors was an awkward novel to plot. It tells one story that lasts a year, with a second that lasts a week. What it also does – crucially – is allows me to ever so slightly reinvent the character of Jessica. Things ARE different in books eight, nine and beyond because she’s had time away from the job. There are new colleagues, new internal issues where she works. That type of thing is essential in a series to stop everyone from getting bored. None of that means the events of books 1-7 are forgotten, in fact a few characters from earlier novels return in Crossing The Line, which is coming in the autumn. It’s also not reinventing the wheel. I write about things, places and people that interest me. It does mean – hopefully – that the Jessica books won’t become repetitive. I’d like to think that’s apparent in the subject matter. Broadly, books 1-3 were standard serial killer fare (that’s not completely true but close enough), book 4 was child abduction; 5 was an arsonist; 6 was organised crime; 7 was a cult. I do try to be different. Part of that is expanding Jessica’s world. Andrew Hunter, the private investigator from Playing with Fire, has his own series beginning in June. Down Among The Dead Men, out in 2015, is a standalone crime novel in the sense it’s self-contained and needs no knowledge of my other books, but it’s set in Jessica’s world. There are events referenced from the Jessica novels; characters whose names regular readers will recognise; plus people who’ll eventually crossover into the Jessica series. All of that is possible because of Jessica’s ‘missing year’ that happens through Behind Closed Doors. An awful lot happened in those 12 months and, soon, readers will be able to find out what. Before all of that, however, it is something COMPLETELY different. My next book is Reckoning, the first in the Silver Blackthorn young adult-fantasy-adventure trilogy. That’s out on May 22. Many more details soon.